(新機動戦記ガンダムW(ウイング), Shin Kidō Senki Gandamu Uingu? ), is an anime series in the mecha genre, and is one of the alternate universe Gundam series, taking place in the After Colony timeline. It is the second alternate universe in the Gundam media franchise, following Mobile Fighter G Gundam. The plot centers around a war between Earth and its colonies in space; however, in contrast to the Universal Century continuity, the Gundam pilots of Gundam Wing are more closely allied to each other than they are to any particular side in the conflict unfolding around them. The series aired across Japan on the terrestrial TV Asahi network. The series ran for forty-nine half-hour episodes, beginning on April 7, 1995 and ending on March 29, 1996. Masashi Ikeda was the overall director of the series. Katsuyuki Sumizawa (Yoroiden Samurai Troopers) wrote the scenario for the series and was one of three official script-writers, along with Akemi Omode and Katsuhiko Chiba. Ikeda wrote one script himself and one with Omode and one with Sumizawa. Toshifumi Kawase also wrote three scripts in the latter part of the first half of the series. Koh Otani composed the music. The series was loosely based on the original 1979 series, Mobile Suit Gundam, created by Yoshiyuki Tomino and Hajime Yatate. 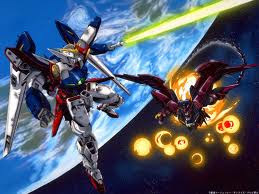 Gundam Wing was among the first series in the Gundam franchise (not including OVAs) to be dubbed in English and was aired on Cartoon Network in the U.S. and the U.K. Since then, the series has also been dubbed into Tagalog, French, Italian, German, Arabic, Spanish, Indonesian, Malay and Portuguese. In the distant future, Mankind has colonized space (with clusters of space colonies at each of the five Earth-Moon Lagrange points), and, down on the Earth, the nations have united as the United Earth Sphere Alliance. However, the Alliance oppresses the colonies with its military power. The colonies desire a peaceful resolution to the situation, joining together in a movement headed by the pacifist Heero Yuy. In the year After Colony 175, Yuy is shot dead by an assassin (believed to be Odin Lowe), forcing the colonies to search for other paths to peace. The assassination also prompts five disaffected scientists from the Organization of the Zodiac (more commonly referred to as OZ) to turn rogue after the completion of the mobile suit prototype Tallgeese. The story of Gundam Wing begins in the year After Colony 195, with the start of "Operation Meteor": the scientists' plan for revenge against OZ. The operation involves five teenage boys, who have each been chosen and trained by each of the five scientists, then sent to Earth independently in extremely advanced mobile suits (one designed by each of the scientists) known as "Gundams" (called such because they are constructed from a rare and astonishingly durable material known as Gundanium alloy, which can only be created in outer space). Each Gundam is sent from a different colony, and the pilots are initially unaware of each other's existence. The series focuses primarily on the Gundam pilots: Heero Yuy (an alias, not to be confused with the martyred pacifist), Duo Maxwell, Trowa Barton, Quatre Raberba Winner, and Chang Wufei. Their mission is to attack OZ directly, in order to rid the Alliance of its weapons and free the colonies from its oppressive rule. The Gundam pilots each start out on separate missions, but encounter each other and then join forces later while on Earth. Along the way, Heero meets Relena Darlian, the seemingly ordinary daughter of Earth's Vice Minister of Foreign Affairs. However, after her father is assassinated by OZ's ruthless second-in-command, Lady Une, it is revealed to Relena that she is really Relena Peacecraft, heir to the pacifistic Sanc Kingdom. Although the five Gundams succeed in destroying several of OZ's supply bases and mobile suit factories, the sinister organization is still able to complete its ultimate goal of overturning the Alliance and becoming the new ruler of Earth and the colonies. Wufei attempts to kill OZ's ambitious yet chivalrous leader, Treize Khushrenada, only to be defeated in a sword duel. Treize, however, admires Wufei's fighting spirit, and allows Wufei to escape so they can fight again another day. Throughout the series, Heero has several mobile suit battles with OZ's "Lightning Count," Zechs Merquise (whose true identity is Milliardo Peacecraft, Relena's older brother). During their second encounter in Siberia, however, the colonies are held hostage by Lady Une, who tries to force the Gundam pilots to surrender their mobile suits to OZ; Heero, in response, self-destructs his Gundam, nearly killing himself in the process. Later on, the Gundam pilots return to outer space, only to find that the colonies they were sent from have now sided with OZ. Marked as rebels, they fall on hard times; Quatre witnesses his father's murder, Heero, Duo and Wufei are captured by OZ, and Trowa enlists as a soldier of OZ (secretly as a double agent). At this time, the Wing Gundam ZERO is introduced. This mobile suit was the original Gundam designed by the five scientists, but was never constructed due to its signature feature: the ZERO System, a combat system that directly interfaces with the pilot's brain and feeds the pilot tactical data on the fly. The downside of this is that prolonged exposure causes hallucinations, and in some cases, insanity. Quatre, who has been driven mad with grief over his father's death and the colonies' betrayal, discovers the schematics for Wing ZERO and has it built. He then uses it to go on a rampage against OZ and avenge his father's death, but he is eventually stopped by Heero and Trowa (although Trowa is nearly killed and suffers temporary amnesia). After returning to Earth, Heero and Quatre take refuge in the newly reopened Sanc Kingdom, which is governed by none other than Relena. The kingdom, however, is being pressured by the Romefeller Foundation (the group that controls most other countries, as well as OZ) to dissolve. By this time, the Foundation has reformated OZ's military force to consist primarily of mobile dolls. Trieze has been confined to Romefeller's headquarters due to his outspoken dislike of the use of unmanned suits in combat (which he feels negate the true spirit of battle). In his confinement, Treize builds the Gundam Epyon and later gives it to Heero. Much like Wing ZERO, Epyon is equipped with the ZERO System. After being affected by the System, Heero fights once more against a returning Zechs, who is piloting Wing ZERO. After the battle ends in another draw, they exchange Gundams and part ways. At the same time, Relena formally dissolves the Sanc Kingdom due to the tremendous pressure from Romefeller. She then becomes the chief representative for the Foundation (at first as a figurehead, but gradually gaining more and more power) under the title "Queen of the World". Eventually, Treize is released from confinement, and he relieves Relena of her crown, telling her that while she has successfully laid the foundation for true peace, he is the one with the strength to bring it to fruition. Treize then takes control of the Romefeller Foundation; at the same time, Zechs returns to space to become the leader of the White Fang organization under his true name: Milliardo Peacecraft. White Fang has seized control of a Peacemillion-class battleship OZ was building for Romefeller to show its military power, called Libra. Zechs fires Libra's main cannon at the Earth, causing great damage to the planet. This prompts Treize to start gathering all of the military power he can muster from Earth's forces to retaliate, while the Gundam pilots remain neutral. White Fang continue to battle the Earth forces by taking out the only remaining OZ base in space: Space Fortress Barge. Eventually, the Gundam pilots choose to fight against White Fang. During the epic final battle, Treize is killed (of his own volition) in a rematch against Wufei, while Heero fights against Zechs one last time. Their battle is broadcast to all of Earth and space by Lady Une; when the citizens see the meaningless battle, they put aside their differences, whether they are from the colonies or from Earth, and form what becomes the Earth Sphere Unified Nation. However, White Fang refuses to surrender, and sends Libra plunging on a collision course with Earth. After several attempts from the other four Gundams to prevent this, Heero intercepts the battle station's remains as it enters Earth's atmosphere and destroys it with Wing ZERO's twin-barrel buster rifle, bringing an end to the war. After the series ended, two OVAs, compiling various scenes from the series along with a few minutes of new footage, were released in 1996 as Gundam Wing: Operation Meteor I, II and III. A three-volume OVA series, Gundam Wing: Endless Waltz, was produced in 1997 as a sequel to the TV series; plot-wise, it brought the After-Colony timeline to a close. In 1998, a movie version of Endless Waltz was made, with additional footage, alterations of the music scores, and a different ending theme song. Gundam Wing was later licensed for release in North America by Bandai Entertainment and was dubbed into English by Ocean Productions. The series was broadcast in the U.S. on Cartoon Network's action-oriented programing block Toonami, premiering on March 6, 2000 and ending on May 11, 2000. In the first extended promo leading up to the series' premiere, voice actor Peter Cullen narrated the back story, evoking memories of Voltron's opening credits. The promo was said to be so riveting that Bandai decided to use it as the official promo for the series. It was broadcast in two formats; an edited version shown in the daytime on Toonami and an uncut version shown past midnight as part of Toonami's "Midnight Run." Examples of the edits included the removal of blood, profanity, and the word "kill" being replaced with the word "destroy" (this was extended to Duo's nickname, "The God of Death", changed to "The Great Destroyer", forcing the alteration of two episode titles), though the word "death" was mostly left intact. The uncut version shown was completely unedited. Reception for the uncut version was a factor in the eventual creation of the Adult Swim programing block, which premiered on September 2, 2001. All Gundam Wing episodes have been released on VHS and DVD in the U.S. Differences between the two video systems is that the episodes on VHS contain the edited version while the episodes on DVD contain the uncut version. Endless Waltz was also dubbed by Ocean Productions and an edited version of it aired on Cartoon Network on November 10, 2000. It was later released on a DVD that contains both the OVA and movie versions. Bagi sahabat yang menginginkan anime ini juga bisa menghubungi Mas Mur melalui Contact me.